Comments: Spider-Man Comics Weekly was Marvel UK's second title (the first being Mighty World of Marvel) and would go on to be its longest running, albeit under several different names during its twelve year run. The first issue, dated 17th February 1873, featured Spider-Man, fresh from appearing in MWoM, and Thor, and it wasn't until #50 that another strip, Iron Man, joined the title. For the first three years of publication Spider-Man Comics Weekly was a stable title, but major changes were on their way. 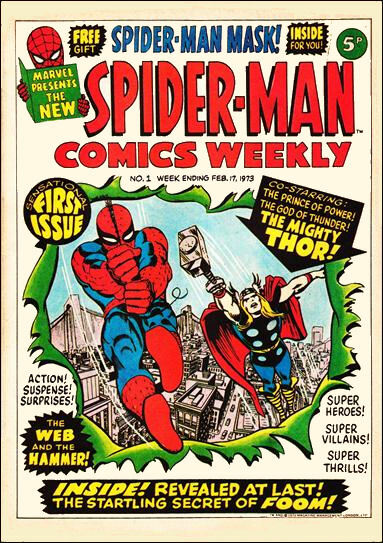 #157 would be the last to go by the original name, as cancelled title The Super-Heroes was merged into Spider-Man Comics Weekly from #158, which was accordingly retitled Super Spider-Man with the Super-Heroes. It adopted a new "landscape" format, whereby the comic was printed longer than it was tall, with each page of the UK comic reprinting two US pages reduced in size and alongside one another. The final issue of Super Spider-Man with the Super-Heroes was #198; a week later The Titans merged with it, and the comic was renamed Super Spider-Man and the Titans. Having been printed as a landscape comic since #158, Spider-Man and the Titans eventually reverted to the more traditional portrait layout with #229, only two issues before another merger, this time with Captain Britain, prompted another name change; #230 was the last issue of Super Spider-Man and the Titans, which became Super Spider-Man and Captain Britain as of #231, July 11th 1977. Captain Britain's new adventures continued through until #247, and from #248-253 the Marvel Team-Up issues that showcased Captain Britain's first US printed adventure were reprinted. Super Spider-Man and Captain Britain #253 marked the British hero's last appearance in the title, and his name was correspondingly dropped from the title, so that #254 (21st December 1977) was simply called Super Spider-Man. In January 1979, Marvel UK editor in chief Dez Skinn oversaw an overhaul of the company's comics line. As part of that, the titles for some longer running ongoing weekly comics were simplified: Mighty World of Marvel became just Marvel Comic, and Super Spider-Man was retitled Spider-Man Comic with 24th January's #311. The new name only lasted a few months. Spider-Man Comic #333, dated July 25th 1981, was the last to use that title. A week later, on August 1st 1979, Spider-Man Comic merged with Marvel Comic to become The Spectacular Spider-Man Weekly and Marvel Comic #334. With #337 the "and Marvel Comic" was dropped, leaving the title just The Spectacular Spider-Man Weekly. On April 24th 1980, #372 dropped the "Weekly" from the title, but a bigger change was imminent; May 15th 1980's #375 was the last issue to go by the Spectacular title. On May 22nd 1980 with #376 the former Spectacular Spider-Man Weekly absorbed its less successful sister title Incredible Hulk, and renamed itself Spider-Man and Hulk Weekly. Previous back-up strips were dropped in favour of beginning reprint runs of She-Hulk and Spider-Woman, so that the two title stars were appearing alongside their female counterparts. The new title lasted until #417 on 4th March 1981; a week later Marvel Team-Up was merged into Spider-Man and Hulk Weekly, which renamed itself first Spider-Man and Hulk Weekly incorporating Team-Up. With #425, this unwieldy name became the simpler, albeit inaccurate in story terms, Spider-Man and Hulk Team-Up. However, the airing of the Spider-Man live action TV show on British TV prompted another title change by #450 on October 21st, when the comic was renamed Super Spider-Man TV Comic, hoping to use interest in the Nicholas Hammond TV series to draw in new readers. With the rebranding came glossy covers and a few extra pages of interior colour. Just under a year later it rebranded again; #499 was the last for the unwieldy Super Spider-Man TV Comic title, and with #500 on October 6th 1982, the title became simply Spider-Man, absorbing the failing Incredible Hulk comic the same week. Spider-Woman rejoined the title with #517 on 2nd February 1983 when her cartoon began airing in the UK, reprinting the same comics which had appeared in Spider-Man and Hulk Weekly less than three years earlier. Fantastic Four returned to the title with #529 on 27th April 1983, following the cancellation of their own title. The last issue using the title Spider-Man, for the time being at least, was #552 on 5th October 1983; a week later, on October 12th 1983 with #553, Marvel UK's longest running title renamed itself Spider-Man and his Amazing Friends in an attempt to capitalise on the popularity of the cartoon series of that name which was then airing on British TV. After three issues reprinting the US comic adaptation of the cartoon's pilot episode, the ongoing Spider-Man strip reverted to reprinting the regular US Spider-Man titles, but the Amazing Friends subtitle was retained. With #567 on January 18th 1984 the comic absorbed failing sister title Thor and the X-Men, acknowledging the merger on the cover but not in the title. The last issue titled Spider-Man and his Amazing Friends was #578; the next issue , #579 (11th April 1984), the comic renamed itself back to just Spider-Man. Spider-Man #595 saw the comic absorb failing sister title The Thing is Big Ben, again acknowledging the merger on the cover but not in the title. Spider-Man #607 to #610 featured a new, non-reprint Spider-Man story. A few months later, with sales dropping, Marvel UK noted that other comics aimed at younger readers were selling strongly and decided to repitch the title at this audience. The Spider-Man stories from the mainstream US titles were replaced, first by the Spider-Man and his Amazing Friends story from the Denver Post free comic, then by reprints of Spidey Super Stories. Other strips included Star Comics' Wally the Wizard (retitled Willy the Wizard in case readers found Wally an unintentionally amusing name, somehow overlooking that Willy had even greater double entendre humour potential) and Fraggle Rock, plus two humour strips from Lew Stringer: Captain Wally and Snail-Man. Dukes of Hazzard, reprinted from Polystyle's TV Comic, was added in #638, and Indiana Jones from Marvel's Further Adventures of Indiana Jones in #646. With #651 (31st August 1985) the comic underwent a further, final title change to become Spidey Comic. By this point the title was firmly aimed at younger readers, and had minimal Marvel universe content. Spider-Man's stories were, in many instances, reprints of Spidey Super Stories, while other pages were filled with reprints of Star Comics' Ewoks, an adaptation of Disney's The Black Cauldron, and Indiana Jones (from Marvel's Further Adventures of Indiana Jones). This bizarre combination was not a strong seller, and Spidey Comics was cancelled on 14th December 1985 with issue 666. Shortly after this, Spider-Man was relaunched in a new series, Spider-Man and Zoids.